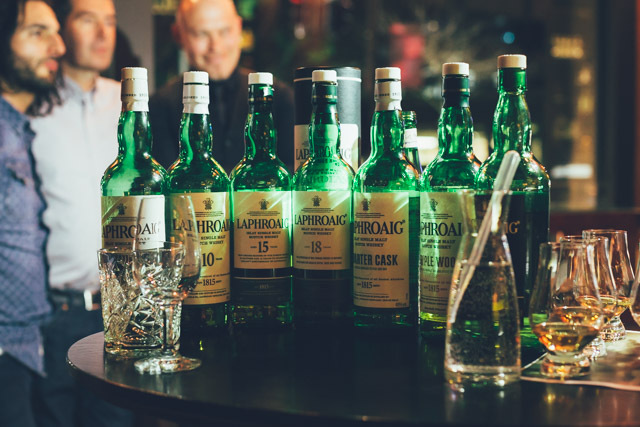 To mark the 200th anniversary of Laphroaig, John Campbell, Laphroaig's Master Distiller recently toured Australia to celebrate the momentous milestone with Laphroaig fans across the country and to showcase the fine Laphroaig range. If you recall, John was also one of the four great whisk(e)y figures that fronted the challenge at the Great Whisky Rumble against Fred Noe, Dan Tullio and Mike Miyamoto. Following the bout, John hosted a couple of Laphroaig masterclasses across Sydney, the first at the Clock Hotel in Surry Hills and the second masterclass at the Grain Bar at Four Seasons. Being Islay born and bred, John Campbell loves all that is Islay. John briefly spoke to his history at Laphroaig which commenced on 14 November 1994 at the Laphroaig warehouse, and since then, has seen him work across the distillery before becoming the Distillery Manager in January 2006. 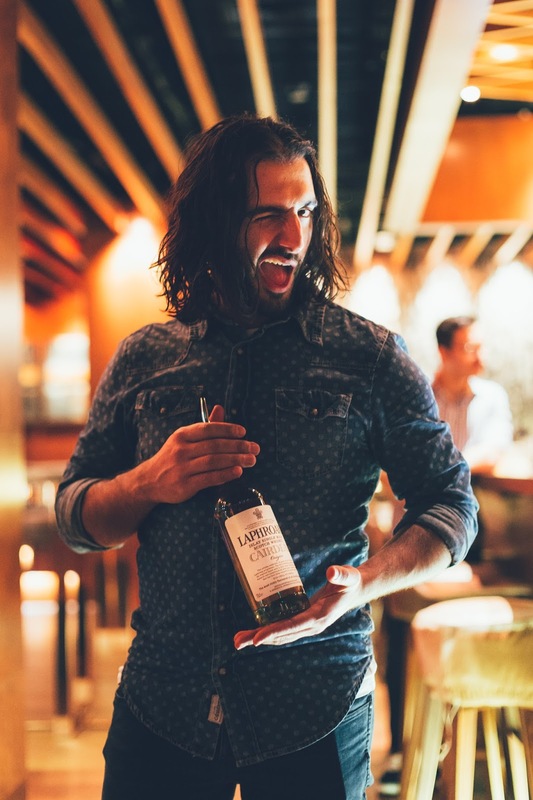 Throughout his time, John had tinkered with different expressions and bottlings and also helped to grow the Laphroaig brand that people have come to know and love globally. During the same period, there was also the decision to discontinue the rather popular Laphroaig 15 in 2009 to make way for the Laphroaig 18. Though, as John mentioned at the Great Whisky Rumble, six years later, the Laphroaig 15 was resurrected as part of the 200th anniversary. Having spoken to different people about this, the sense is that the old Laphroaig 15 is perceived as the better expression than the new Laphroaig 15 released this year. Martin had also tried this particular dram back in 2013 and found it to be one very pleasant dram. Nevertheless, despite the different views, as Laphroaig had recently campaigned, all opinions are welcomed and we can all share our thoughts as we enjoy a Laphroaig dram or two. As the host, John was also joined by our local Laphroaig aficionado Dan Woolley, National Laphroaig Ambassador and Michael Nouri, Laphroaig Brand Ambassador. Both Dan and Michael have made their mark in the whisky (and drinks) industry over the years, and it was good to see them both supporting John at the Laphroaig masterclass. The masterclass took us from the lightest Laphroaig, sometimes coined as the 'Breakfast Laphroaig' - the Laphroaig Select, all the way to Laphroaig 25 Year Old and the Cairdeas release from 2012. I was amazed at the breadth of the different Laphroaig expressions, and yet we all know that the lineup is only a small subset of the larger Laphroaig portfolio. In fact, following this masterclass, I sampled the Laphroaig 10 Cask Strength (which is, in my view, truly remarkable) and am currently eyeing the Laphroaig An Cuan Mor; a Laphroaig travel retail expression that involved the use of first-fill bourbon barrel. Will have to see if I can sample it soon. An interesting, light Laphroaig expression that blends five different whisky maturation profiles including whiskies that have been matured in oloroso sherry butts, European oak, Pedro Ximenez sherry hogshead, ex-bourbon quarter cask, first-fill ex-bourbon American oak and virgin American oak. The opinions shared through 'Friends of Laphroaig' were split; 50% loved it, 50% hated it. I think this is one approachable Laphroaig, or perhaps, one approachable Islay whisky, a breakfast whisky. The classic Laphroaig 10 is the highest selling Islay Whisky globally and in fact, it's John Campbell's Laphroaig of choice. This is an enjoyable expression though I am a recent convert of the cask strength version of this expression. The 200th anniversary version of the Laphroaig 15 is a resurrected version of the 15 year old. This particular expression was released to Friends of Laphroaig and it sold out in hours though stock has been replenished in recent months. One of my highlights of the night - simply beautiful. John Campbell described that this particular expression included older whiskies, whiskies from the 18 year old and 21 year old batches. Another classic and a favourite of many. A beautiful creation that makes use of small bourbon quarter casks for finish resulting in big and bold sweet notes. Nose: Thick and you can smell summer fruits then it mellows out and I get breakfast cereal, grain. The peat is soft. Another interesting, big, bold Laphroaig that is rich in flavour with gentle peat overall. Bottled at cask strength, this expression keeps on giving. A Cairdeas release from 2012 brought to us by Michael Noury and Dan Woolley. This was served with a special Laphroaig cured prosciutto, just enough oils from the cut to cleanse and ready the palate for this special expression which saw the use of quarter casks for seven years and the blending of whisky from the 18 year old through to 21 year old batches. Bottled at cask strength, this was a particularly enjoyable expression - in fact, my favourite of them all. Finish: Extremely long, rich, warming finish, one would appreciate this finish on a good winter day. Laphroaig Triple Wood saw the triple maturation of whiskies from the first maturation in American oak, ex-bourbon barrels, followed by maturation in a small 19th century style ex-bourbon Quarter Casks. The final maturation was done in specially selected, large European oak, oloroso sherry butts. The result is a wonderfully rich and powerful Islay single malt. So there we go - eight Laphroaig expressions later and I am truly a Laphroaigconvert, a Friend of Laphroaig and have shared one or two Laphroaig opinions. With John Campbell at the helm, Laphroaig has gone from strength to strength, exemplified through all the interesting and bold Laphroaig expressions released under his watch. Now with 200 years under Laphroaig's belt, I believe the future is bright for the distillery and I am personally excited for what's to come from Laphroaig and John next year. Until then, keep on dramming.